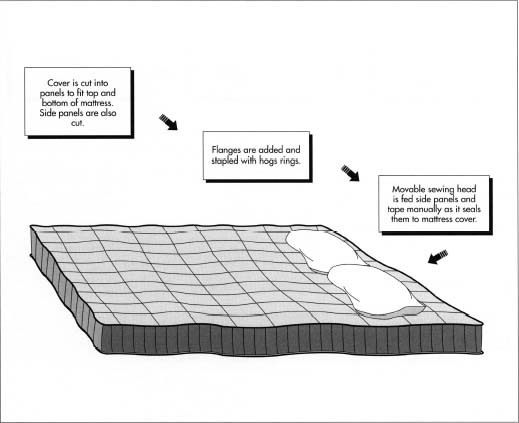 From the available evidence, it seems fairly certain that the concept of the mattress originated during prehistoric times. By lying on piles of leaves, straw, and animal skins, early humans were able to sleep more comfortably and more soundly than they could have on hard surfaces. As greater numbers of people left a nomadic, hunting existence for a settled, agrarian lifestyle, primitive furnishings, including the bed, began to develop. To a large extent the development of the mattress is closely linked with that of the bed. In many ancient societies, the bed was considered the most important piece of furniture in the household; often, it provided a central gathering place for dining and relaxing as well as sleeping. Over the centuries, bed frames became more elaborate for those who could afford luxury; however, mattresses themselves remained unsophisticated—and uncomfortable. Until the twentieth century, they generally consisted of lumpy pads filled with horse hair, cotton, or rags. Poorer people relied on ticks —fabric sacks stuffed with straw, corn cobs, or other crop debris. In addition to offering an inconsistent texture, such primitive mattresses were difficult to clean—and they generally started out dirty, stuffed as they were with agricultural debris that often entered the pad or ticking with soil and insects. However, they offered one concrete advantage: made at home from cast-off farm goods, they were cheap. Even late in the nineteenth century when small local manufacturers began to produce mattresses commercially, the items remained inexpensive because early mattress makers continued to rely on extremely inexpensive stuffing (usually, unusable fabric remnants discarded by second-hand tailors). Mattresses with stabilizing interior springs, probably the single most significant advance in mattress design, were first developed during the mid-1800s. By placing a set of uniform springs inside layers of upholstery, mattress manufacturers could imbue their product with a firm, resilient, and uniform texture. However, because so-called innerspring mattresses were expensive to manufacture, only luxury ships and hotels that could pass the cost along to their affluent patrons purchased them initially. It was not until after World War I that innerspring mattresses were mass-produced by Zalmon Simmons, Jr., the president of a company that had theretofore produced bedsteads. Despite the fact that Simmons asked 40 dollars—more than twice the cost of the finest horse hair mattress available at that time—for his innerspring mattress in 1926, his products proved so comfortable that millions of Americans purchased them. To render potential customers more willing to spend what must have struck many as a small fortune on his innerspring mattress, Simmons promoted the advantages of a good night's sleep. The effectiveness of this marketing strategy has only increased over the years, as subsequent research has confirmed that abundant, high-quality sleep constitutes a fundamental component of good health. Today's sophisticated mattresses improve sleeping comfort in several ways. First, through a variety of enhanced innerspring designs, modern mattresses distribute the weight of the body over a broad area; this also helps to prevent differential wear on the mattress. In addition, mattresses offer surfaces of appropriate softness and flexibility to help keep the spine in its naturally curved position. However, contemporary mattress manufacturers carefully avoid excessively soft surfaces that would distort the position of the sleeper's spine, resulting in discomfort or even pain. Presently, the consumer demand for mattresses is fairly consistent. In 1990, approximately 16 million mattresses were sold in the United States. Together with foundations, mattresses accounted for about $4 billion in retail sales. With the exception of a few large companies, most mattress manufacturers are fairly small, community-based operations. Of the approximately 825 mattress factories across the United States, most are still owned and operated by the founding families. Today, most mattresses are manufactured according to standard sizes. This standardization was initiated by the industry to resolve any dimensional discrepancies that might occur between companies that manufacture beds and companies that make mattresses. The sizes include the twin bed, 39 inches wide and 74 inches long; the double bed, 54 inches wide and 74 inches long; the queen bed, 60 inches wide and 80 inches long; and the king bed, 78 inches wide and 80 inches long. The "core" of a typical mattress is the innerspring unit, a series of wire coils that are attached to one another with additional wire. The upholstery layers are affixed to the innerspring: the first, called the insulator, is fitted directly onto the innerspring and prevents the next layer, the cushioning, from molding to the coils. While the insulator is fairly standard, the number of cushioning layers can vary widely in number, ranging from two to eight layers and from 1/4 inch to 2 inches (.63 to 5 centimeters) in thickness. Moving outward, the next component is the flanges, connecting panels that are attached to the mattress's quilted cover with large, round staples called hogs rings. The top, bottom, and side panels of the mattress are stitched together with border tape. While a wide variety of springs are designed to accommodate special needs and situations, the four most commonly used coils are the Bonnell, the Offset, the Continuous, and the Pocket System. The Bonnell springs are hourglass-shaped and knotted at both ends. The Offset design is similarly hourglass-shaped, but its top and bottom are flattened to facilitate a hinging action between the coils. The Continuous innerspring consists of one extremely long strand of steel wire configured into S-shaped units. Finally, in the Pocket System, each coil is encased in a fabric casing that also connects it to neighboring coil-casing units. A typical mattress contains between 250 and 1,000 coil springs, and mattresses that use fewer coils normally require a heavier gauge of wire. It is not uncommon for an innerspring unit to require as much as 2,000 linear feet (610 meters) of steel wire. The individual coils can be joined in several ways. One common method is to use helicals—corkscrew-shaped wires that run along the top and bottom of the springs, lacing the coils together. Rigid border wires are sometimes attached around the perimeters to stabilize the unit. Most manufacturers also produce foundation mattresses or boxsprings that lie directly beneath the mattress, resting on the frame of the bed. One of the most common types of box spring foundations uses a spiked coil configuration, in which the springs are narrow at the bottom but spiral to a wider diameter at the top. While a spring system provides the most common type of boxspring support, torsion bars are also sometimes used. Other foundation mattresses contain no springs at all but consist of a built-up wooden frame. Once the completed innerspring unit is received, workers manually apply the insulator. Next, they apply the cushioning layers that will determine the feel and comfort of the final product. Meanwhile, the decorative cover that will serve as the exterior for the top, bottom, and sides is made on a giant quilting machine, which controls a multitude of needles that stitch the cover to a layer of backing material. tape that holds the ticking together is made of heavy-duty, fibrous, synthetic material. The underlying boxspring may consist of either a wooden frame with slats or of metal coils similar to those used in the mattress itself. The boxspring may be upholstered, but, even if it is not, it always receives a fabric covering. 1 Most mattress manufacturers subcontract the production of the innerspring unit to an outside firm that specializes in making springs. Once the completed spring unit is received and inspected, the workers manually apply the insulator. Next, they apply the cushioning layers that will determine the feel and comfort of the final product. 2 While the mattress is being "built up" in one part of the plant, the decorative cover that will serve as the exterior for the top, bottom and sides is being made in another part. Usually this cover is made on a giant quilting machine, which controls a multitude of needles that stitch the cover to a layer of backing material. The stitching chosen serves both useful and ornamental purposes, as it must prevent the mattress cover from slipping or creeping over the layers of cushioning in addition to creating a visually pleasing exterior. 3 Once the fabric is quilted, it is cut into panels that will fit the top and bottom of the mattress. The side panels are often cut from this same composite or made separately on a border machine. If side handles or vents are to be added, they are attached to the side panels before these are applied to the mattress. 4 Specially modified sewing machines are used to attach the flanges to the top and bottom panels, and the hogs rings are stapled to the flanges. Everything is now ready for the closing operation, during which the hogs rings will be secured to the innerspring unit. 5 The closing operation is of one of the most highly skilled and critical procedures in the entire process. It is done with a movable sewing head that is mounted on a track. Tape edge operators manually feed the top, bottom, and side panels and a heavy duty binding tape into the sewing machine as it moves around the mattress. As this combination of materials is fed into the machine, the operators uses their skill to feed the proper amount of each material into the machine to produce a professionally tailored product. 6 Some of the highest quality mattresses may also feature a pillowtop, a panel filled with soft upholstery and attached to the top and bottom panels of the mattress for a more luxurious feel and appearance. Prequilted, the pillowtop is then taped to the mattress. Once the cover is quilted, it is cut into top, bottom, and side panels. Next, flanges are added, and hogs rings are stapled to them. Finally, in the closing operation, workers use a movable sewing head mounted on a track to feed the top, bottom, and side panels and a heavy duty binding tape into the sewing machine as it moves around the mattress. The mattress is then ready for packaging. it consists of a wooden frame that may or may not have a layer of upholstery attached to its top. Regardless of the internal composition, the frame is usually inserted into a pre-sewn cover that encases the top and sides of the unit. A border fabric that matches the mattress exterior is applied to the sides, and a dust cover is added to the face. 8 Once the units are complete, they are inspected for quality. If every thing is in order, they are labeled with the content and the contingent "do not remove" tag, required by law to ensure the consumer that the contents are properly represented in the labeling. The finished product is then transported to the packing area. Here it is inserted by hand or by automated machinery into protective plastic or paper covers. Additional information about the warranty, safety, and care of the product is also included in the packaging. During the manufacturing phase most quality control procedures are carried out by sight. The majority of manufacturers implement inspections at critical points in the production process: after receiving the innerspring, before the closing, and before packing. Fire is a very real danger with all conventional mattresses, and the industry and the federal government have long sought ways to limit that danger. Since 1973, manufacturers selling in the United States have been required by law to make mattresses that resist ignition by cigarettes. In 1987, the industry voluntarily began to include tags on mattresses that warn consumers of potential fire hazards. In recent years a great deal of research has been done on the relationship between effective sleep and the sleeping environment. Since comfort and sleep are to a great extent subjective, it is often difficult to quantify the results of such studies. However, many of the larger companies continue to spend a considerable amount of money on research, especially on the design of the innerspring. In these studies quality and comfort are key considerations. While traditional innerspring construction continues to account for the lion's share of the mattresses produced in this country, both the water bed and the air mattress are gaining in popularity. While these unique designs require many different skills and production technologies, the growing demand for them over the last 20 years indicates a significant new trend. American Innerspring Manufacturers, 1918 North Parkway, Memphis, Tennessee, 38112.
International Sleep Products Association, 333 Commerce St., Alexandria, Virginia, 22314. National Home Furnishings Association, P.O. Box 2396, High Point, North Carolina, 27261. I need to know, ASAP,what the difference is between a guest bed mattress that is 80% polyurethane foam pad and 20% blended fiber batting and one that has a Miracle Foam topping instead of the fiber batting. I'm confused as to which is more comfortable or pros and cons. Thank you for your quick assistance. Thanks for the information. Where can I buy supplies, material to make the mattress, tools? All to be competitive a price with manufacturer companies. Thanks again for you article and help. PS. IS there a still a market for mattress making?